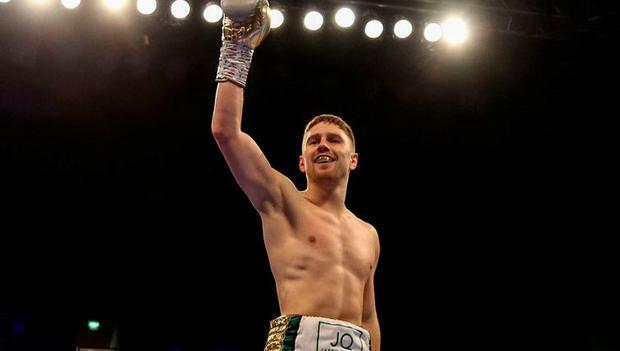 Undefeated Irish middleweight Jason Quigley improved to 16 wins on his UK debut after making short work of Mathias Eklund at London's Copper Box on Saturday night. The Donegal orthodox, the first Irish male boxer to reach an AIBA World Elite final in the amateur ranks in 2013, stopped the Finn in the second round. Quigley dominated the first frame and rocked his 34-year-old opponent with a sweeping hook after switching to southpaw. Eklund was hurt by a big right from the Irishman in the second and the referee waved it off 63 seconds into the frame with the disorientated Finn being pummelled on the ropes. "Delighted with the win. We're looking to stay busy and keep climbing those world rankings," said Quigley after his first victory outside of the USA. Undefeated Welsh bantam Sean McGoldrick, who boxed briefly with an Irish club, outpointed Liverpool's Sean Cairns on the Copper Box card. McGoldrick and Quigley fought out of the Finn Valley BC in Donegal and won county titles on the same day in the amateur code in 2009. Meanwhile, Dubliner Lynn Harvey lost her bid for the vacant European minimum-weight belt after being stopped by Andalucia native Catalina Diaz in Madrid on Saturday night. Harvey enjoyed some success with her jab in the opening round but Diaz began landing the cleaner punches and dropped the Irishwoman in the third. The Kilbarrack fighter was wobbled again in the fifth and taken into protective custody by the ref later in the round after Diaz landed a barrage of shots. Fury will take on the undefeated German on June 15 at the Thomas & Mack Centre. He is excited to be returning to America after overcoming two knockdowns in a draw against WBC heavyweight champion Wilder in Los Angeles. "I'm very fit and ready, so I can't wait. Tom Schwarz is a young, fresh and ambitious fighter, but I'm going to put on a good show as usual," said Fury. Should he win, Fury is expected to have another fight in 2019 before facing Wilder again in the first quarter of 2020.